THE BRITISH CABINET is meeting today to discuss how to proceed with Brexit negotiations. 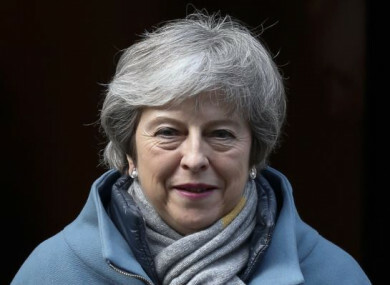 The process was thrown into doubt yesterday when John Bercow, Speaker of the House of Commons, said Prime Minister Theresa May cannot have another meaningful vote on her Brexit deal if changes are not made to it. “This has given us quite a lot to think about in the immediate term. There are ways around this – a prorogation of parliament and a new session – but we are now talking about not just days but hours to the 29th of March,” Buckland told BBC News. Asked about this statement, May’s official spokesman today said: “If you were to look back to the speech which the Prime Minister gave just before ‘meaningful vote two’, she said that if MPs did not support ‘meaningful vote two’ we would be in a crisis. I think events yesterday tell you that that situation has come to pass. Bercow cited a ruling from 1604 to justify his decision to block another vote on the draft Withdrawal Agreement struck between the British government and the European Union – it was overwhelmingly rejected by MPs in January and again last week. Despite this, Brexit Secretary Stephen Barclay has suggested a vote could still take place next week. Barclay told BBC Radio 4′s Today programme, however, “serious consideration” is being given to Bercow’s intervention and that it is important to “respect the referee”. The Democratic Unionist Party, which campaigned in favour of Brexit and props up May’s minority government, believes the backstop threatens the United Kingdom and could lead to a trade border in the Irish Sea. Negotiations to get the DUP and other MPs onside are ongoing behind the scenes. European leaders, including Taoiseach Leo Varadkar, have repeatedly said the deal can’t be renegotiated. Varadkar met European Council President Donald Tusk in Dublin this morning and Brexit was at the top of the agenda. Meanwhile, Tánaiste Simon Coveney is due to meet Guy Verhofstadt, the European Parliament’s Brexit coordinator, and Europe’s Chief Brexit Negotiator Michel Barnier in Brussels today. In other Brexit news, the UK’s Information Commissioner’s Office has fined ‘Vote Leave’ £40,000 (about €47,000) after an investigation found that the campaign sent more than 196,000 text messages to members of the public ahead of the 2016 referendum and was unable to provide evidence people had given their consent to be contacted. Email “Theresa May's spokesman says the Brexit crisis she predicted 'has come to pass'”. Feedback on “Theresa May's spokesman says the Brexit crisis she predicted 'has come to pass'”.